Happy Birthday to the Dow! The Dow Jones Industrial Average was first calculated by Charles Dow 120 years ago today, on May 26, 1896. First things first, happy birthday to the granddaddy of all the U.S. stock market indexes! The index got its name from Dow and his business associate, statistician Edward Jones. The first calculation had only 12 components, all industrials by the way. Fun stat, General Electric is the only original component that remains in the current index. Today, the index consists of 30 large publicly owned companies in the United States, with all major industries covered. Remember, as times change, so do the components. In fact, the composition of the components has changed 51 times during the past 120 years. One other distinguishing factor about the Dow is that it is price weighted, not market capitalization weighted like the S&P 500 Index. Therefore, a company that is priced higher holds more weight in the pricing of the index than a company that has a larger market cap, but a lower stock price. The best year ever was an 81.7% gain in 1915; the best since 1950 was a 44% gain in 1954. Incredibly, that gain in 1915 took place in the midst of World War I (WWI). The worst year ever was a 52.7% drop in 1931; the worst since 1950 was the 33.8% drop in 2008. The largest one-day drop ever was the crash of 1987, as the Dow lost 22.6% on October 19, 1987. The only other time it ever dropped 20% was on December 15, 1914, when it lost 20.5%, as news of the German/Russian front continued to gain ground during WWI. The longest winning streak ever was 13 straight days in January 1987, with 1941 and 1968 tied for the longest losing streaks at 12 days. The longest yearly win streak was nine in a row during the 1990s, from 1991–1999. The longest yearly losing streak was four in a row from 1929–1932. It has had a three-year losing streak only four times, most recently 2000–2002. 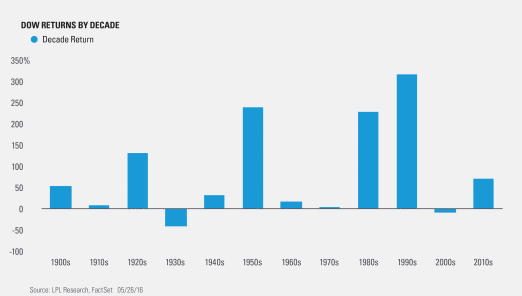 Breaking things down by all the decades since 1900 shows that only twice has it seen negative returns during a full decade: the 1930s and 2000s. The 1990s, with more than a 300% gain, was the best decade ever. So far, the 2010s are off to a nice start at a 71% gain with a few more years to go. The average gain during the previous 11 decades was 89.6%. Thanks to Charles Dow for creating something that has been a passion for so many of us over the years. Past performance is no guarantee of future results. All indexes are unmanaged and cannot be invested into directly. Unmanaged index returns do not reflect fees, expenses, or sales charges. Index performance is not indicative of the performance of any investment. The Dow Jones Industrial Average Index is comprised of U.S.-listed stocks of companies that produce other (non-transportation and non-utility) goods and services. The Dow Jones industrial averages are maintained by editors of The Wall Street Journal. While the stock selection process is somewhat subjective, a stock typically is added only if the company has an excellent reputation, demonstrates sustained growth, is of interest to a large number of investors, and accurately represents the market sectors covered by the average. The Dow Jones averages are unique in that they are price weighted; therefore, their component weightings are affected only by changes in the stocks’ prices.